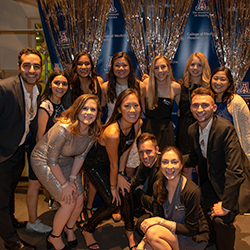 First-year medical students at the University of Arizona College of Medicine – Phoenix raised about $9,000 at the 12th annual charity gala benefiting Students Supporting Brain Tumor Research (SSBTR) on Saturday, Feb. 9. According to SSBTR, within the next 12 months, more than 200,000 people in the U.S. will be diagnosed with a primary or metastatic brain tumor. Because of their location at the control center for thought, emotion and physical function, brain tumors are difficult to treat and often severely compromise the quality of life. This year’s theme was “Night at the Disco” with music from DJ Neurotoxin and inspirational speakers that included a keynote from Cynthia Wetmore, MD, PhD, a pediatric hematologist-oncologist with 23 years of experience. Dr. Wetmore is director of the Center for Cancer and Blood Disorders at Phoenix Children’s Hospital and a faculty member at the UA College of Medicine – Phoenix. She gave an inspiring talk on the breakthroughs in brain tumor science and how one brave victim donated her cells to further research. The evening also included a special presentation from Beth Oelkers, the parent of a College of Medicine – Phoenix student and brain tumor survivor. Oelkers underwent two surgeries after which, she had to relearn how to speak and do many other basic tasks of daily living. “In 2016, brain cancers became the number one cause of cancer death for children and teens,” Farhadi said. “Our event raises awareness to this fact, so hopefully by raising money for research we, as future physicians, will be able to offer potential life-saving therapies and treatments." Attendees mingled at the Phoenix Children’s Museum, bided at the silent auction, enjoyed dinner and dancing with music provided by DJ Neurotoxin. Fifteen first-year medical students organized this event, led by Farhadi, Belle Keni Lin, Charlotte Archuleta and Vidhi Bhargava. Proceeds went to SSBTR, a non-profit whose beneficiaries are Barrow Neurological Institute, National Brain Tumor Society, Phoenix Children's Hospital, Translational Genomics Research Institute and the University of Arizona. “These institutions are all in the Phoenix area and their research can hopefully be the beginning of real change,” Archuleta said.